Check with your doctor before using patches for weight loss. The weight loss product and service industry is a multi-billion dollar market and weight loss patches are included in this popular consumer marketplace. With the average annual growth rate expected to be 13.2 percent through 2007, weight loss patches, pills, books, food and new items yet to hit the stores are sure to expand. But are weight loss patches effective and safe? By wearing a patch directly on the skin, a transdermal delivery of the substance in the patch is absorbed directly into the bloodstream for a prolonged period of time. Most weight loss patches are replaced on a daily basis and are water-resistant. The patch can be adhered to clean skin at several locations, although the hip or thigh typically are suggested sites. This is one of the most common diet patches on the market. It is described as a quick, proven, safe and easy way to lose weight. It is an herbal-based formula without ephedra or caffeine in its composition. One patch is worn for twenty-four hours before being replaced with a new one. However, most reviews of the Ultra Slim Weight Loss Patch stated it did not cause weight loss or reduce cravings or appetite. The high costs of the product, along with the company's poor customer service were reported as deterrents to its use as well. 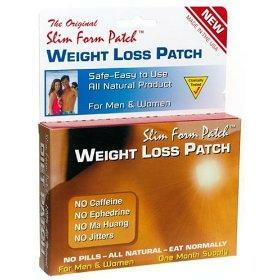 This is another patch that guarantees weight loss in an easy, fast and natural way. Controlling appetite, burning fat, increasing energy and stimulating metabolism are included in its advertising claims. The company offers a 60-day supply when the Maximum Result Package is purchased, a total cost of $199.95. Its main ingredient is fucus vesiculosus. Also known as bladderwrack, this compound enhances metabolism by regulating iodine utilization in the thyroid gland. Marketed as the "World's Strongest and Best", this weight loss patch states that scientific studies prove the combination of algae and minerals reduce food cravings, leading to a reduced calorie intake and weight loss. It is an all-natural composite of weight loss substances similar to the others. There have been no known side effects of using diet patches, except for the possibility of rash at the patch location on the skin. However, it is important to keep in mind that there are no governing agencies monitoring diet patches. This raises questions to be asked regarding the quality of the product, the claims made about the product and its overall safety. Most patches have not shown any significant amount of weight loss among its users. In addition, information inserts often include a statement regarding the necessity to follow a healthy diet and engage in moderate exercise for total effectiveness. With costs averaging between $18.00 and $30.00 for a month's supply, it is wise to find a more effective way to lose weight that includes permanent lifestyle changes. Joining a well-known weight loss program like Weight Watchers, or seeking the advice of a trained nutritionist are valuable alternatives.